I’ve never been the timeliest of book bloggers. A part of that stems from the books that I love; those richly layered books that speak of a classical sensibility and timeless potency, and those books about girls at boarding schools in Austria. I read books from 1901 alongside those from 2015, and I love to find the dialogues between them. The ties of literature. The golden ties of British children’s literature. The building blocks of our national literary voice. I heard about Mango and Bambang a long time ago and I was thrilled. Intensely, madly, because I was lucky enough to know both Polly Faber and Clara Vulliamy online and I was, and am, a fan of their work. Vulliamy’s work is something I have blogged about before, for her art is nuanced and clever, subtle and generous, a frank delight in every page. Rich, too, with the layered detail present in them, and that clever, clever eye towards the reader. Always. A consciousness of the view and artwork that revels in such. I love her work, truly. In Mango and Bambang, Vulliamy illustrates four deliciously sized stories from Polly Faber, a blogger who I’ve similarly admired for a while. Faber’s generous and lovely and rich writing is a delight. And so, to this book, which I was both gleeful over and mildly terrified, because I wondered in that British way of always seeing the best in things : what if I didn’t like it? Oh reader, how I did. How to begin to describe this package of utter loveliness, of a charming and warmly detailed friendship between a lonely girl and a tapir? Mango and Bambang is ferociously eccentric, rather brilliantly so, but through that eccentricity carves itself a space that makes me think of E Nesbit and Dodie Smith, and I love that. I love that little tingle on the back of my spine that makes me think of golden age authors, because then I know that I like this book. I like it a lot. The dialogue between text and image is wonderful; exuberant in some points, where Mango barks orders at the frenetic cityscape, and poignant at others, intensely so, when Mango stands in spotlighted isolation and the words are almost pushed off page because there isn’t enough space for them: “She looked / smaller than / usual on / her own / under the / lights.” It’s small stuff, but God, it’s clever. I suspect I’m burbling. I would burble more if I gave you this review in person. If I did, I’d pull your attention to the moment where Bambang wears Mango’s spare swimming hut and show you potentially the most beautiful and loving sketch of a proud, slightly self-conscious but very much loving his life, tapir. Possibly the only example of such in existence, but when it’s this good, why seek for competition? I’ve never been the timeliest of book bloggers. I heard about Mango and Bambang a long time ago, and I loved it then, and I think I might marry it now. This book is good. So, so, utterly perfectly so. It’s golden. But there are now. And now I get to go to them! And it’s weird, but every time I come out I think – I want this. I want this world. I want children debating where to put the otters and how best to make an icecream umbrella. (“I’ve coloured it blue because it’s blueberry icecream”), and I want people talking about where best to put the shark fin. I want this, this legitimising of creativity. Of being a bit different and of colouring out of the lines and not worrying about neat cutting. Can I tell you you should really go and see Clara Vulliamy if you ever can? She’s really, really good. And lovely! And SO good at what she does. Watching her live-draw a scene from Dixie O’Day is a genuine joy (and so skillfully done!). There was a point where she tilted the pad to the side to illustrate a (no spoilers here!) cliff-hanger of a moment, and I was sold. This is before seeing the tiny felt Dixie and Percy in their model car and learning that the only place Dixie does not wear his tie is either in the bath or in his pjs, which just, er, sold me more. But I think the reason you should go and see somebody like Vulliamy (and if you can, go with somebody like @childledchaos who is terribly splendid and inspirational) is that you will feel like this afterwards. Which is a great and brilliant and joyous thing. Julia Donaldson wrote an excellent piece in the Daily Telegraph about how we don’t take children’s literature seriously enough. I read the comments on this piece (don’t, as one of my fabulous Twitter friends advised, ever read online comments) and wrote this in response. A few days later, the Guardian published this piece of eye-opening (and infuriating) research about the nature of reviewing and being reviewed in the print media. I think this topic is Becoming A Bit Of A Thing for me. I know that papers like the Guardian have substantial online coverage, but it’s an attitude that does not translate into their print version. And that’s sort of my issue. It’s about breaking out of the echo-chamber, outside of the ‘children’s literature space’ and into the ‘literature space’. It’s about not housing the children’s literature, picture books, YA reviews, whatever, in a fenced and contained space at the back of the supplement, or fifteen clicks away from the main site corralled in a children’s book section, it’s about treating these books (which are the first thing your children read) with the respect and excitement and the time that they deserve. Recently the Independent announced that they’re launching a new Children’s Book blog which is very exciting and something I’ll be definitely watching. And my offer to write for the Guardian (I’ll even do my own proof-reading!) is still on. Just in case you missed them, here are some of my most popular reviews / pieces of the last thirty days. Follow Me Down by Tanya Byrne, Pantomime by Laura Lam, two Chalet School reviews (Genius and Two Sams), and two slightly more theoretical pieces:- The Use Of Framing And Composition in Ellen and Penguin (by Clara Vulliamy) and a thing about the Complications of Being Merely Whelmed by a book. I’m hoping to do a few more ‘in-depth’ picture book reviews in the future so would welcome titles of a particularly writeable nature (I think my next may be something on the use of colour in Beegu following this lovely review over on Childtastic which made me discover this incredible book). There was a point on Wednesday, when I fell in love with our new children’s laureate. Of course I knew how good Malorie Blackman was (I gave away copies of Noughts and Crosses for World Book Night 2013 and reviewed it here). And then I read this and saw her namecheck the Chalet School and I swooned a little bit. Malorie, if you ever fancy being interviewed about the Chalet School, you let me know okay? 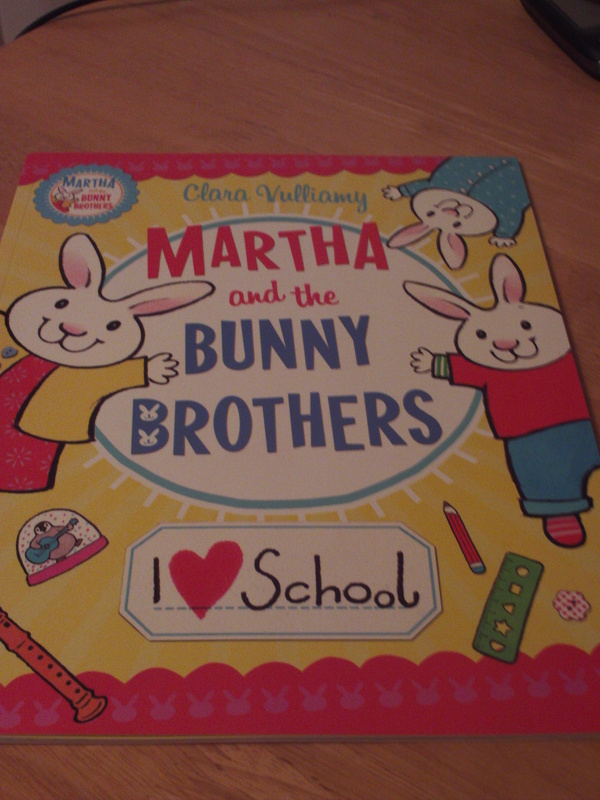 I’ve been wanting to do a slightly more in-depth review of a picture book for a while, and when I came across the very gorgeous Martha and the Bunny Brothers by Clara Vulliamy it felt like the perfect opportunity. 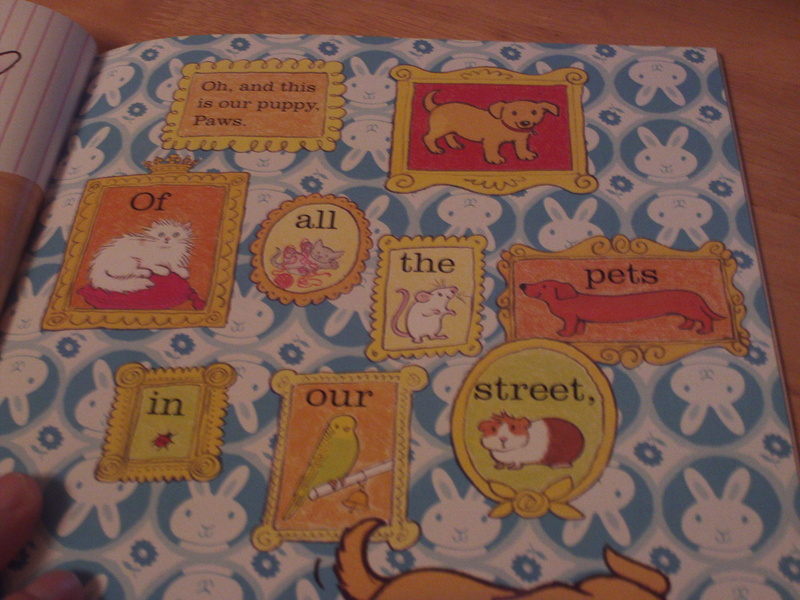 What I want this post to do is give you a bit of background on how I read picture books. I don’t have children. I don’t read them with children. I read them in a sort of different manner that I think is worthy of examination. So where do I start? I take a look at the plot, briefly, but usually I start by looking at the front cover (1). The front cover of a picture book is vital. The intended audience is quite often pre/emerging literates and so the words may mean very little. It’s about the feel. And this feels gorgeous. It makes me smile. Hugely. I love how the little I ❤ School motif on the bottom, right in the centre has a distinct exercise book / name label quality to it , what with the little dashes underneath and the carefully formed lettering on top of it. There’s a lot to be said as well about the exuberance of the bunnies. We have Martha and her brothers, all of them smiling and arms outspread. This is such an open moment, these rabbits aren’t hiding anything from you. They want you here. This book wants you here. It would be rude not to read it. Once inside, we immediately see this (2). There’s a lot here that’s making me happy. The bold felt-tip pen colours continue (which I like, feeling instantly drawn back to school), and we start to see shapes being introduced. One recurrent motif turns out to be these scalloped edged circles. 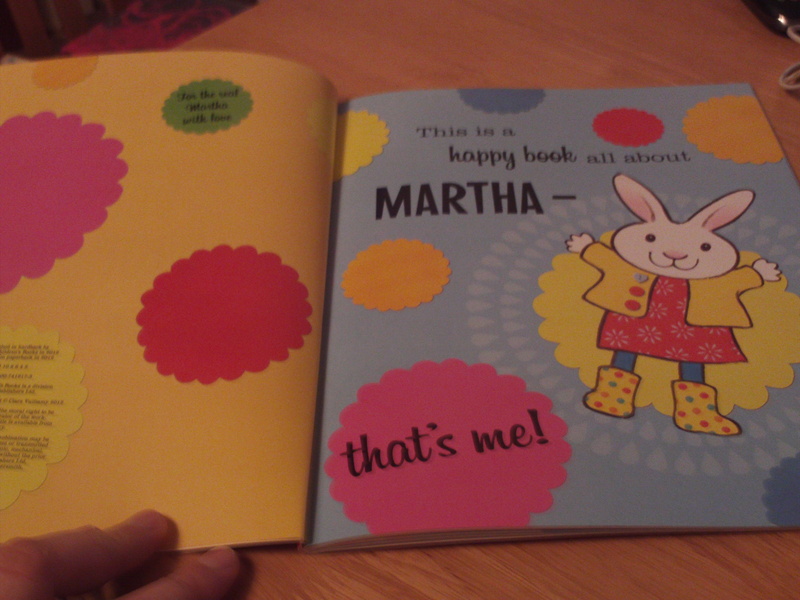 I really enjoy the dialogue between the pink circles on the left hand side – one, two, three “That’s me!”. There’s an exuberance in that movement, stretching all the way across the double page spread, pulling the reader visually to a bright and exciting discovery at the end of it. I also love the way that Martha errupts from the inside of her own circle. That springy sense of ‘I’m here!’, the way she doesn’t quite fit in her circle, she’s too big for it. I love that – the construction of an image that is, in its own way, as complicated as the highest of textual metaphor. To discover it so early in a book is reassuring to say the least. The next double page spread (3) is the moment that I know this book has got me. And it’s a very specific moment. 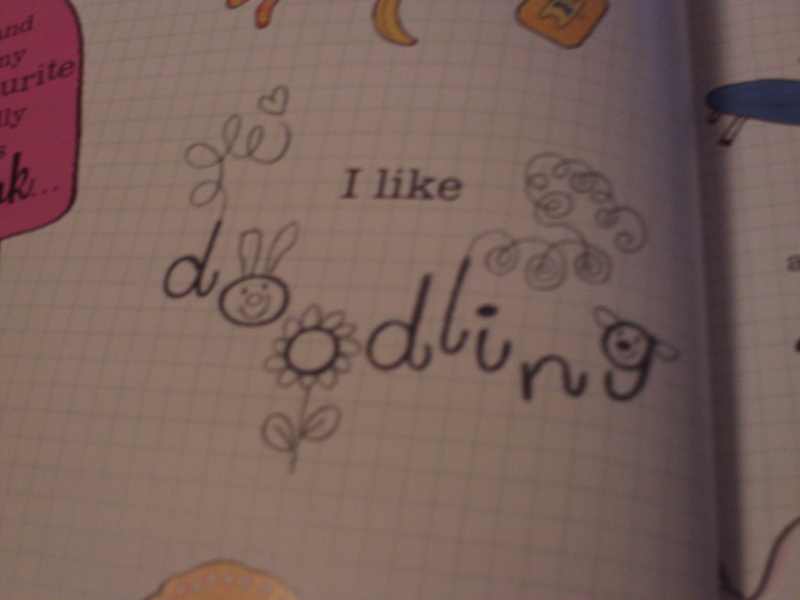 It’s in this little section (4), right by the spine, where Martha says that she likes doodling, and the way the typography slides, very gloriously right through to the ‘background’ of the page, and the doodles spin off into the page. I love books that acknowledge their form, that connect the front image with the back, and acknowledge the glorious potential of these layers of image. I mean, it’s glorious. This book is so lovely and put together with such a genuine love for the subject and the medium, that it’s a rampant pleasure to read. Moments such as (5) where the story slides into the picture frames set against a rabbit Toile de Jouy is lovely. It’s a play on the overly formal living room setting, cheekily undermined by Paws racing across the bottom with a shoe in his mouth. And so this is the moment where I make my decision, and it’s balanced on all of this. It’s balanced on how a book makes me feel, on whether I go through it with a smile, of whether I’m intrigued and excited, of whether I’m surprised about what comes next. It’s also thinking about whether I’d like other people to see it, to enjoy it, to feel like what I did. And it’s about thinking about how I’d feel if I saw it in the hands of my niece or nephews, or my friend’s baby. It’s about thinking what I want this books journey to be in the world. But, sometimes, all of that doesn’t matter. Not at all. Because sometimes a book just makes you feel intensely happy that it exists and that’s what has happened here. I’m sold. 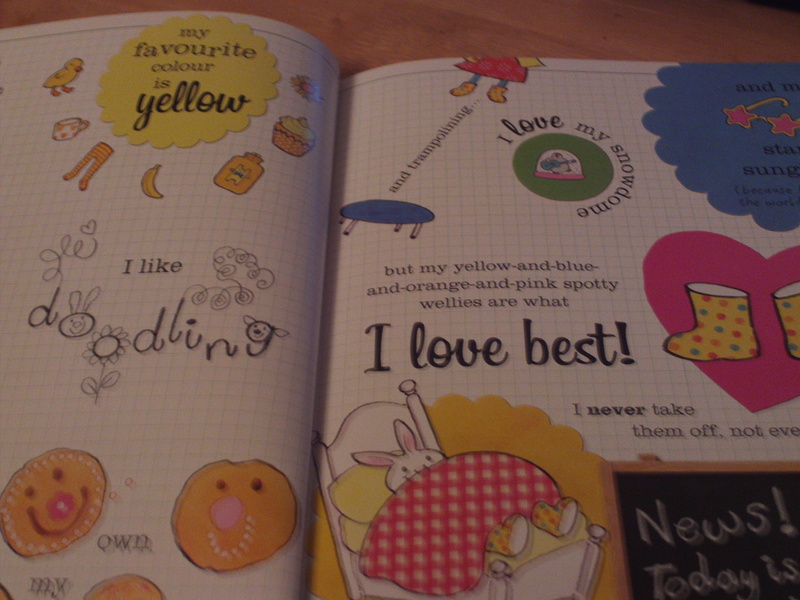 I was sold ever since I saw those pink circles, that doodling beat, and the way the book is so furiously happy in what it is. Martha, I really really like you. You made me proper happy.